Effective February 16, 2017, Diamond Medallion Members plus one guest who are traveling in Delta Main Cabin, Virgin Atlantic Premium Economy or Virgin Atlantic Economy cabin are able to access the Virgin Atlantic Clubhouse located in Terminal 3 in London-Heathrow. Diamond Medallion Members traveling in Delta Main Cabin, Virgin Atlantic Premium Economy or Virgin Atlantic Economy cabin and passengers traveling in Delta One or Virgin Atlantic Upper Class are all eligible to access both the Virgin Atlantic Clubhouse and No1 Lounges, both located in Terminal 3. 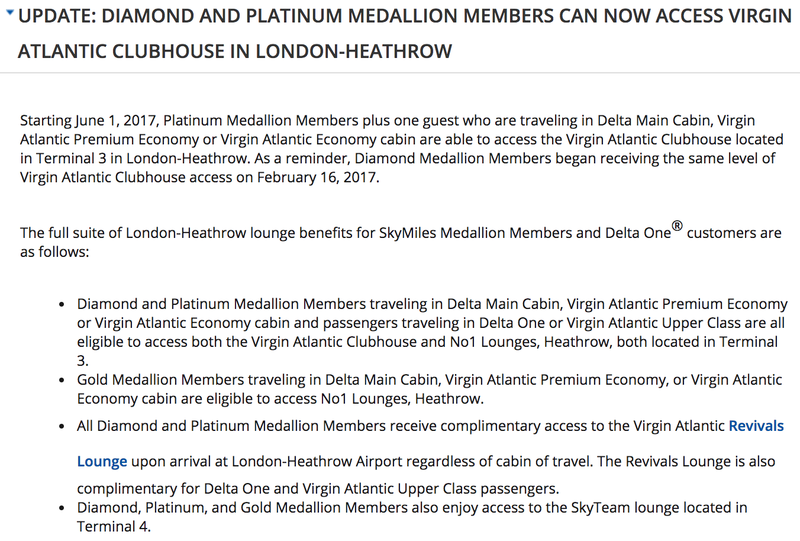 Platinum and Gold Medallion Members traveling in Delta Main Cabin, Virgin Atlantic Premium Economy, or Virgin Atlantic Economy cabin are eligible to access No1 Lounges. All Diamond and Platinum Medallion Members receive complimentary access to the Virgin Atlantic Revivals Lounge upon arrival at London-Heathrow Airport regardless of cabin of travel. The Revivals Lounge is also complimentary for Delta One and Virgin Atlantic Upper Class passengers. Many travelers “in the know” avoid connecting at London’s Heathrow Airport whenever possible — but for Delta’s top elite members, there’s been a reason to drop by. Up until today, Diamond and Platinum elites have had access to the Virgin Atlantic Clubhouse, which is arguably one of the best business-class lounges in the world. You’ll find the usual perks, like free drinks, speedy Wi-Fi, fine food (plus a deli), and then there are some unique add-ons, like complimentary haircuts and shaves (though only when you’re flying with Virgin Atlantic). 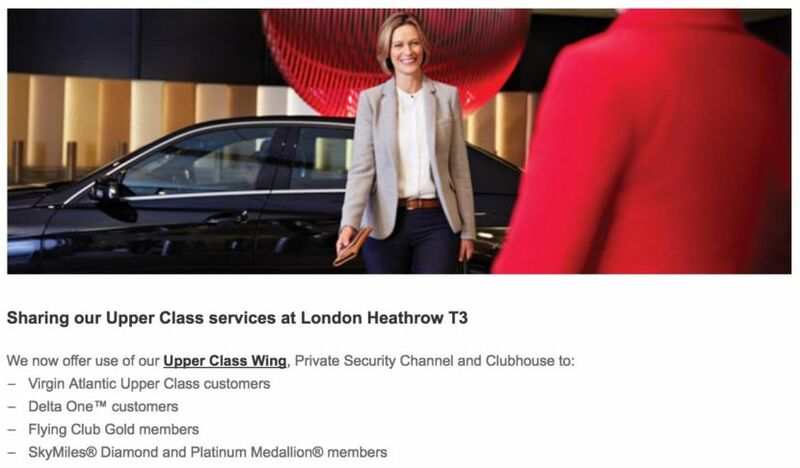 Virgin Atlantic still lists Clubhouse access as a Delta elite perk. So, what’s changed? As of today, Delta’s moved its Heathrow operations to T3, which is where the Clubhouse is located. That move brings many more eligible guests within walking distance of one of Heathrow’s most appealing hangouts, which would have meant potential overcrowding at the Clubhouse. At the same time, given the proximity to the lounge, this move has had Delta elites pretty excited — you can imagine the disappointment, then, when Delta announced today that Diamond and Platinum members flying in economy won’t be able to get in. And that starts right away. The No. 1 Lounge at Heathrow. Instead, Diamond, Platinum and Gold members will have access to the No. 1 Lounge in the same terminal. This is a fine lounge (we reviewed it earlier this year), but, well, it’s no Virgin Atlantic Clubhouse. You can also get into it with a Priority Pass membership. Additionally, the Delta Arrivals Lounge will be closing next week, at which point Delta Diamond and Platinum members (in addition to business-class passengers) will be able to access the Virgin Atlantic Revivals Lounge at LHR. Meanwhile, Delta One and Virgin Atlantic Upper Class passengers will still have access to the Clubhouse, so all is not lost — those traveling on economy tickets won’t be so fortunate, however. And Delta elites traveling from T4 will continue to have access to the SkyTeam lounge there. Will you miss Clubhouse access as a Delta elite?